When Senator John Kerry visited Gaza last week, he made certain to emphasize that he had no contact with Hamas, and demanded that the militants stop firing rockets into Israel. Still, Kerry’s visit  one of the first to the coastal strip by an American legislator since Hamas took power there in 2007  wasn’t exactly the kind of publicity that Israeli officials wanted. While being escorted into Gaza by an armed United Nations convoy, Kerry was disturbed by the sight of Israeli security forces blocking trucks filled with pasta from entering the beleaguered territory. Pasta, the Senator was told by U.N. officials, wasn’t defined by Israel as humanitarian assistance, prompting him to raise the matter with Israel’s Defense Minister Ehud Barak  who then allowed the shipment in. Both Kerry and Secretary of State Hillary Clinton have urged the Israelis to increase the volume of humanitarian assistance into Gaza, which remains under an Israeli blockade. Of more concern to Israel, perhaps, is the fact that Kerry’s visit highlighted the crumbling of the U.S. and Israeli effort to isolate Hamas inside its Gaza ghetto. Not only did the Islamist organization survive the Israeli incursion aimed at smashing its military capability ; it took advantage of the fog of war to mop up what remains of its rival Fatah movement in Gaza. And as the international effort to rebuild Gaza gathers momentum, it confronts the inescapable political fact that nothing can be done in Gaza without the consent and cooperation of Hamas, which remains firmly in control of the territory. Like Kerry, a growing cadre of politicians and statesman  most recently, E.U. 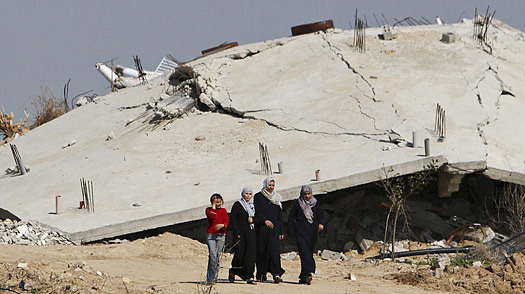 foreign policy chief Javier Solana on Friday  have visited Hamas-controlled Gaza to survey the wreckage. And while most will ritually eschew contact with Hamas, they are well aware that cleaning up the humanitarian mess left by Israel’s incursion and rebuilding Gaza will require reaching a modus vivendi with the organization, whose popularity among Palestinians continues to grow. Ironically, perhaps, a military campaign to break Hamas’ grip on Gaza may, instead, have forced many of Israel’s allies to recognize the futility of efforts to topple the organization through military and economic pressure. Hamas isn’t invited to the Gaza aid conference set for the Egyptian resort town of Sharm el-Sheikh on Tuesday, but its control of the territory is an inescapable fact for those attending, including Secretary of State Clinton. Although the U.S. insists that reconstruction money for Gaza be directed through the Palestinian Authority in order to bypass Hamas, that distinction may soon become moot. Egypt, which has aided U.S. and Israeli attempts to isolate Hamas  a close ally of Egypt’s banned Muslim Brotherhood  is currently hosting reconciliations talks between Hamas and Fatah in Cairo. Egypt’s hostility to Hamas has not diminished, but Egyptian leaders have recognized that the organization is an intractable political fact in Gaza. And the purpose of the unity talks, to which both sides have agreed, is the creation of a national unity government. Indeed, the brutal reality laid bare in the aftermath of Gaza is that it is Fatah  the longtime ruling party of the Palestine Liberation Organization, whose moderate leadership is backed by the U.S.  rather than Hamas that may be headed the way of the Dodo. Palestinians are increasingly angry that after years of negotiations and photo opportunities with American and Israeli leaders, President Abbas has not managed to secure an end to settlement activity or an end the occupation of the West Bank. His paralysis in the face of Israel’s Gaza operation simply confirmed what many Palestinians have long believed about the limits of his influence over events. The reconciliation process agreed to by Hamas and Fatah delegates in Cairo will include the holding of new elections in both Gaza and the West Bank, and Hamas is expected to once again emerge the winner. And, should reconciliation talks fail, Hamas is likely to prove stronger on the ground, and could even potentially topple Fatah in the West Bank, where opinion polls show that Hamas is currently more popular than Fatah. As Ben Ami and his colleagues wrote, the idea of a peace process that bypasses Hamas may now have gone the way of much of the Middle East mythology of the Bush Administration.